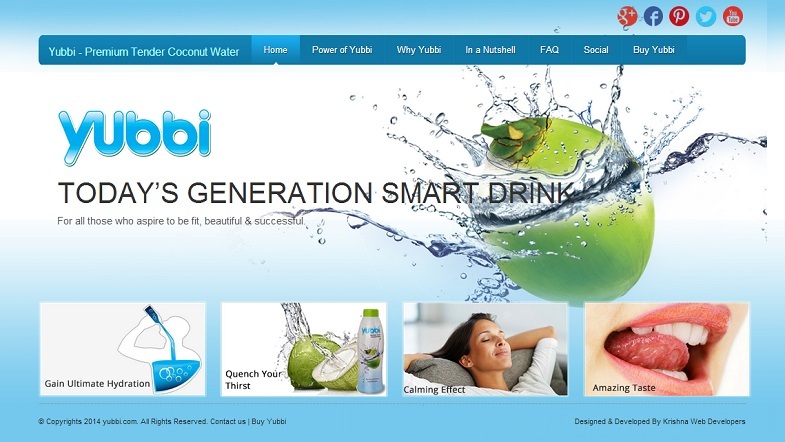 Yubbi is a Product information website . Website is very attractive as many images are used. Here one can find all information about Yubbi, Power of Yubbi,Why Yubbi,Where can we buy yubbi,its stores location. Yubbi is a certified drink by FSSAI Standards and technology certification by Defense Food Research Laboratory. Yubbi Tender Coconut Water is not comparable with other packed Fruit Juice & Beverages as other beverages are from concentrates while Yubbi coconut water is in purest form. The quality maintenance further contributes to higher costs in both production and processing. We are of the opinion that Yubbi is well worth for it.